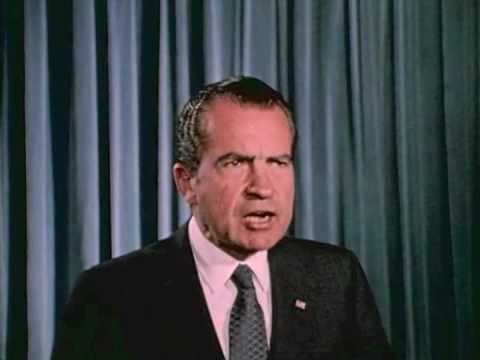 At a press conference on June 17, 1971, President Nixon, with his newly appointed Drug authority at his side, declared drug abuse “public enemy number one.” “In order to fight and defeat this enemy,” he continued, “ it is necessary to wage a new, all-out offensive.” With that statement, the “war on drugs” began. Caution must be heeded when confronted with the popular perception of Nixon’s “war on drugs.” It has been blamed, rather unfairly, for steering national drug policy to the law enforcement modality most familiar to the nation today. A second look reveals the complete opposite. Though loathe to drug culture and especially drug pushers, Nixon wanted to see real results and was not interested in ideological battles. The facts before him were clear: crime and drugs were sweeping the nation. In 1960, there were over 200 narcotics related deaths in New York City. In 1970, that figure had risen to over a thousand and heroin addicts numbered in the tens of thousands. Crime rates in the United States had risen by over 100% since the end of the Eisenhower administration. Nixon was a pragmatist, and he understood that a rational approach was needed to reverse the drug problem effectively, and with hope, permanently. One Oval Office meeting on May 26, 1971, demonstrated his distinctive pragmatism. Wanting to help build up the struggling Bureau of Narcotics and Dangerous Drugs, Nixon met with the agency’s chief, John Ingersoll. While Ingersoll touted the Bureau’s string of operational successes (seizures of heroin were up, arrests were up, more investigations were under way), Nixon wondered aloud whether these accomplishments actually helped solve the underlying problem of narcotics demand. Indeed, Nixon perceived an attack on the supply of narcotics rather ineffective if the demand side received little to no attention. He firmly believed that no matter how hard the country pushed against the supply of narcotics, demand for these substances would remain and find its way into American lives. Meanwhile, as attention from the White House on the domestic drug problem accelerated, an epidemic of heroin use among soldiers in Vietnam added to the problem’s complexity. With President Nixon’s Vietnamization program in full gear, more and more American GIs were slated to return home. Their return to the states risked an influx of new heroin addicts to an already overburdened drug enforcement system. Of the few specialists exploring drug treatment nationwide, Dr. Jerome Jaffe was leading a highly successful Illinois Drug Abuse Prevention program centered around flexible treatment options for drug addicts. His work caught the attention of government officials and later of President Nixon himself, who had been looking for an outsider to lead a new drug strategy. Summoned to Washington D.C. to offer his views on the GI drug problem, Jaffe recommended assembly-line-like urine testing, where soldiers would be tested as they prepared to board planes to return home. If a GI tested positive for opiates, they would not be subject to court-martial or imprisonment, but to a mandatory stay in Vietnam for a period of two weeks or so for detox. This alone was intended to serve as a powerful deterrent for those yet addicted to stop heroin use on their own, while effectively detoxing those already addicted. Jaffe’s imaginative approach did, however, depend on essentially decriminalizing drug use, something many in the government bureaucracy were loath to support. But the promise of his proposal and the urgency of the matter merited serious consideration. Shortly after convincing the Pentagon to move forward with this program, Jaffe quickly won President Nixon’s approval. Nixon saw the appeal of Jaffe’s program and wanted him to apply it domestically. In short order, the president announced the creation of a new agency called the Special Action Office for Drug Abuse Prevention (SAODAP) within the jurisdiction of the Executive Office of the President. The new agency would be headed by none other than Jaffe. To underwrite the effort, President Nixon requested $155 million in new funds, $105 million which would be made for treatment and rehabilitation nationwide. For the first time in the history of the United States, the government offered treatment to any drug addict that needed and wanted it; heroin addicts were now given a choice of rehabilitation without fear of being criminalized for their drug addiction. By 1973, federal funding for President Nixon’s treatment and rehabilitation programs reached $420 million. The nation’s drug problem demanded new thinking, something President Nixon pursued as pervasive drug abuse threatened the very fabric of American cities. Nixon introduced more funding, consolidated agencies and enforcement, and directed a concerted attack on the demand side of the drug problem. Overall5, the president’s treatment program was incredibly successful. The number of heroin addicts declined in America’s inner cities as more and more people signed on for treatment. Crime rates, a central focus of President Nixon’s 1968 campaign platform, had fallen in seventy-two of the nation’s largest cities including Chicago, New York, Detroit, San Francisco, and Los Angeles. On domestic policy issues, President Nixon had an exceptional ability to navigate through contentious issues that might have otherwise fallen victim to political gridlock. As Jeffrey Donfeld, staff assistant to the president who co-authored the legislation that created SAODAP, once noted about Nixon’s political gravitas, “It took a law-and-order president to go up against the law-and-order establishment and say, ‘Let’s give this a try.’” President Nixon’s approach to the nation’s drug problem was indicative of just that.